Find D-Link’s hardware version number and other information,is actually very simple. 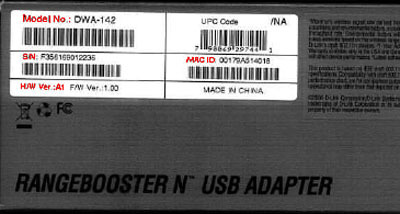 The serial number(SN), hardware version/revision information, MAC address and model number, will be located on a label on both the outer box, and on the adapter itself, usually attached to the bottom of the unit.You can depending on the HW ver corresponding to the firmware upgrade. Ref my DI-524 H/W Ver I1 F/W Ver 9.01 S/N QIO72B8061410. Do I have the latest firmware ?